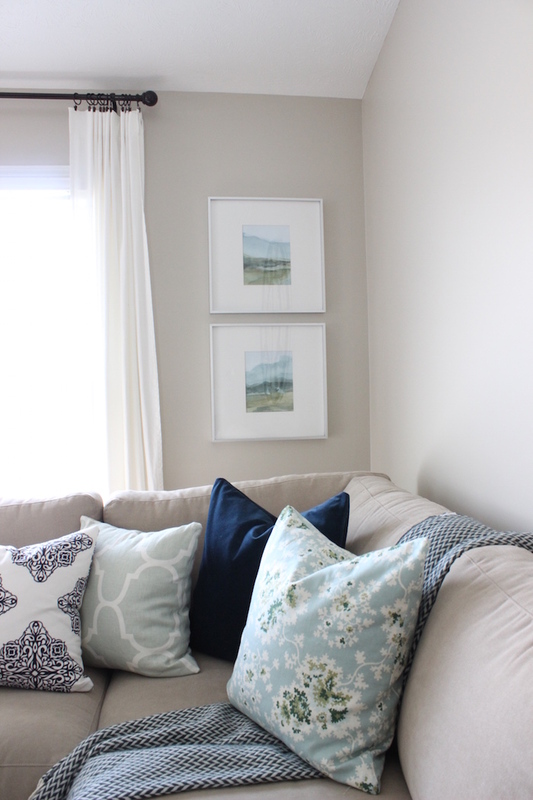 If you stopped by my living room spring tour that I posted two weeks ago, you may have noticed the new wall art that we hung. What used to be here was the first piece of artwork that Paul and I bought for our apartment a few years back on clearance at Home Goods, and although I still like the piece and it is sentimental, it just doesn't really go well in the space. That said, when I decided to change it up a few months back I knew I wanted to use the same gallery frames that are in our hallway and I wanted art prints that had blue in green in them that looked abstract. I searched all over on Etsy and other places to find art prints, but I had no luck finding any 8x10 prints that I liked that would fit in the frames. So like every other time when I can't find exactly what I want, I decided to customize my own! We have been making a lot of progress in our kitchen lately, which has been very VERY exciting seeing as I've wanted to update our kitchen since moving in, and now we are finally seeing our ideas come into action is quite exciting. If you follow me on Instagram or Snapchat (@grandvillelife), you may have seen that this past weekend we starting tackling the backsplash, but before I share details about that, today I thought I would share with you a project that we did weeks ago: changing our canned lighting over our sink into a pendant light. 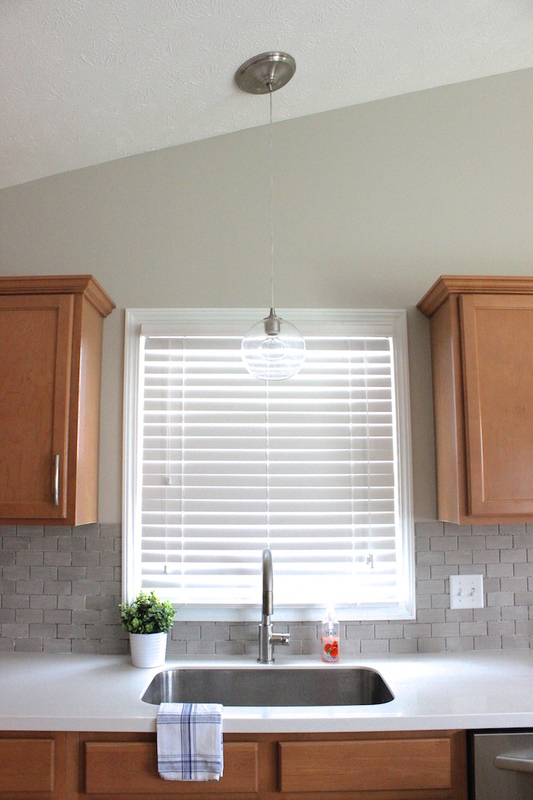 When we started coming up with ideas for this makeover I knew I wanted to hang a light over the kitchen sink. The only problem with that idea was that we have canned lighting and I didn’t want to hire an electrician, so I thought a pendant light was out of the question. After doing some research though, I discovered that you can convert a canned light into a pendant light by using a pendant light conversion kit, so we did just that! At the end of the post I have listed out 20 different pendant light conversion kits, but before then I thought I would show you how easy it is to transform a canned light into a pretty hanging pendant! I’m thrilled to be teaming up with Kathleen from Lindsay Hill Interiors along with 24 bloggers to share a “one room” spring tour. 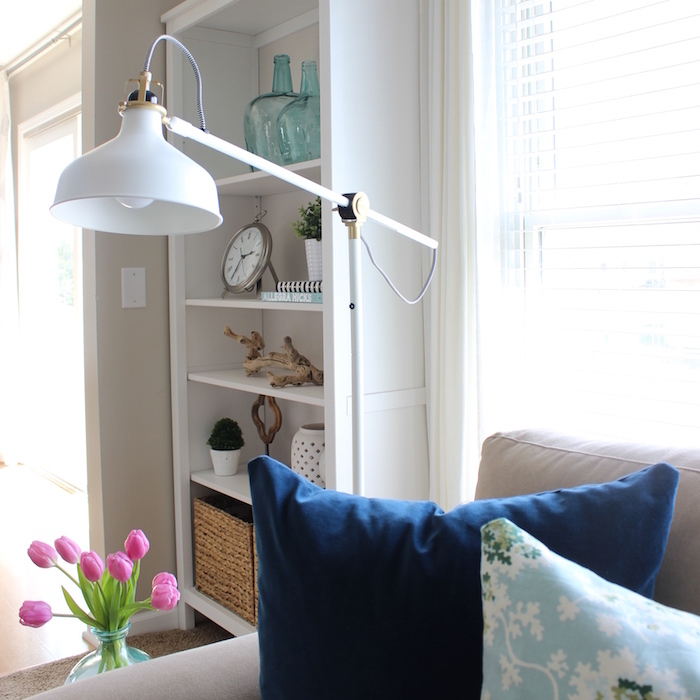 I, along with 4 other bloggers will be sharing our living rooms today and if you want to check out other rooms on the tour, at the bottom of the post I have all 24 bloggers and their one rooms linked up at the bottom of this post so you can follow along! All of their homes are gorgeous so make sure to check them out! If you are new on my blog, welcome, I’m so glad to have you here! My husband and I bought our house a year and half ago after getting married, and since then we have been working to make it our own. 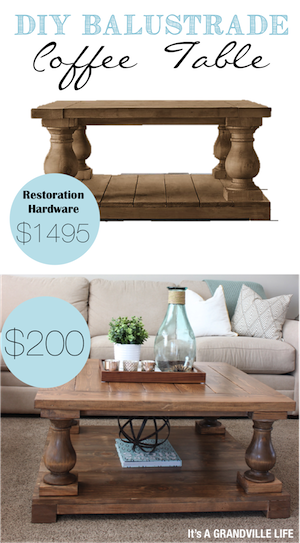 I hadn’t been loving our living room lately, so I took this spring as an opportunity to freshen things up. I didn’t overly decorate with seasonal décor, but rather stuck with the color palette that runs through the rest of our house: blue and green, my favorite colors and perfect for spring! 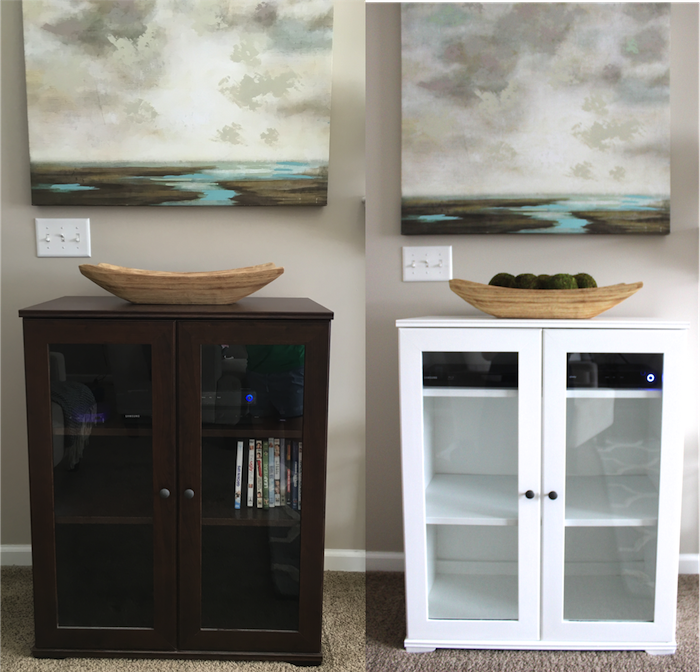 I have an obsession with white furniture, so it shouldn't come as a surprise that this past week I decided to paint our Ikea media cabinet white. What is surprising though, is that my husband suggested that I do it, say what?!?! Paul is not usually one to encourage me to take on projects because he doesn't like change, but it was the first piece of furniture we bought and the laminate was shiny and didn't go with our coffee table and the rest of our furniture that we had since bought, so he suggested I paint it and I ran with that! If you recall, I painted the laminate night stands in our guest bedroom last fall and well, it didn't go so well. I tried to do it as cheaply as possible so I used wall primer and wall paint, and in doing so everything bubbled up and it was just a nightmare. I'm so happy to tell you though that this time painting laminate was SOOO much better!! With most painting/staining projects the key is to take time to prepare the piece, and this time I gave it extra attention and I think that's what made the biggest difference. Continue reading to get step-by-step instructions. Hi friends!! Oh how I've missed you all! 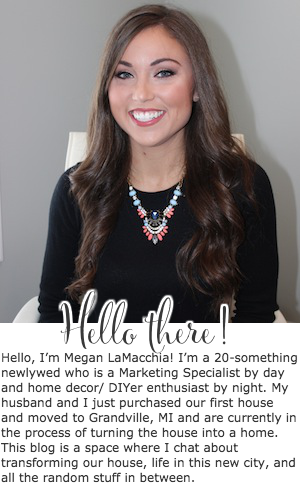 I feel like I haven't blogged in forever so it feels great to be back on here. 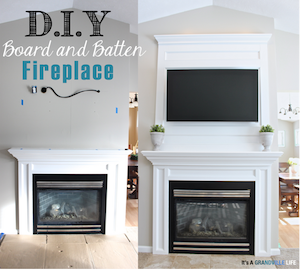 I have a lot of blog posts lined up about projects around the home in the next upcoming weeks, so before that I thought I would jump on here and give a quick update about what's been going on in the past few weeks before I jump to all that fun stuff! 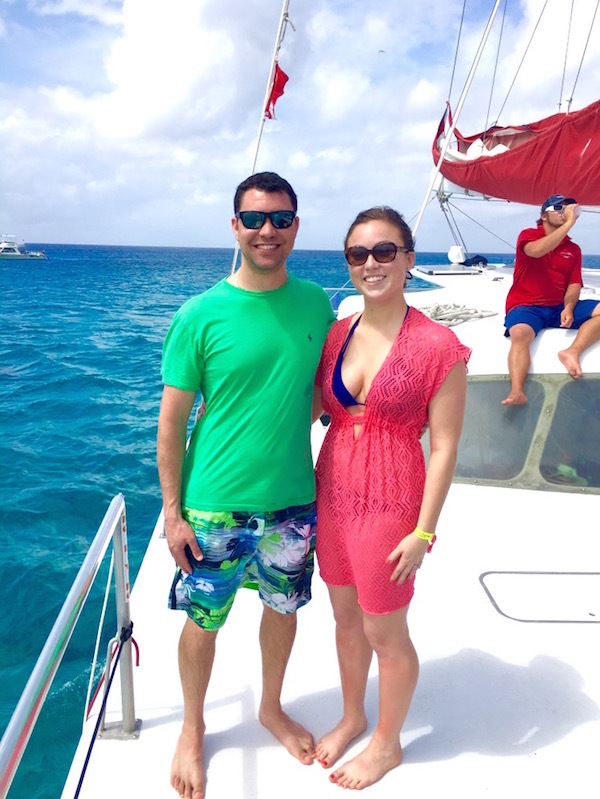 Two weeks ago my hubby and I went on a cruise with my family that stopped in Grand Cayman and Cozumel. We had a great time and it was so nice getting away from Michigan's cold weather and soaking up some sun. I didn't take many pictures during the trip because I like to stay off my phone on vacations these days, but I did snap one while on the catamaran in Grand Cayman and while at dinner in Tampa.